Located along the Douro river estuary in Northern Portugal, Porto is one of the oldest European centres, and its historical core was proclaimed a World Heritage Site by UNESCO in 1996. The western part of its urban area extends to the coastline of the Atlantic Ocean. Its settlement dates back many centuries, when it was an outpost of the Roman Empire. Its combined Celtic-Latin name, Portus Cale, has been referred to as the origin of the name "Portugal", based on transliteration and oral evolution from Latin. In Portuguese, the name of the city is spelled with a definite article ("o Porto"; English: 'the port'). Consequently, its English name evolved from a misinterpretation of the oral pronunciation and referred to as Oporto in modern literature and by many speakers. One of Portugal's internationally famous exports, port wine, is named for Porto, since the metropolitan area, and in particular the caves of Vila Nova de Gaia, were responsible for the production and export of the fortified wine. In 2014, Porto was elected The Best European Destination by the Best European Destinations Agency. In 1387, Porto was the site of the marriage of John I of Portugal and Philippa of Lancaster, daughter of John of Gaunt; this symbolized a long-standing military alliance between Portugal and England. The Portuguese-English alliance, (see the Treaty of Windsor) is the world's oldest recorded military alliance which inspired the formation of NATO. In the 14th and the 15th centuries, Porto's shipyards contributed to the development of Portuguese shipbuilding. It was also from the port of Porto that, in 1415, Prince Henry the Navigator (son of John I of Portugal) embarked on the conquest of the Moorish port of Ceuta, in northern Morocco. This expedition by the King and his fleet, which counted among others Prince Henry, was followed by navigation and exploration along the western coast of Africa, initiating the Portuguese Age of Discovery. The nickname given to the people of Porto began in those days; Portuenses are to this day, colloquially, referred to as tripeiros (English: tripe peoples), referring to this period of history, when higher-quality cuts of meat were shipped from Porto with their sailors, while off-cuts and by-products, such as tripe, were left behind for the citizens of Porto: tripe remains a culturally important dish in modern day Porto. Wine, produced in the Douro valley, was already in the 13th century transported to Porto in barcos rabelos (flat sailing vessels). In 1703 the Methuen Treaty established the trade relations between Portugal and England. In 1717, a first English trading post was established in Porto. The production of port wine then gradually passed into the hands of a few English firms. To counter this English dominance, Prime Minister Marquis of Pombal established a Portuguese firm receiving the monopoly of the wines from the Douro valley. He demarcated the region for production of port, to ensure the wine's quality; this was the first attempt to control wine quality and production in Europe. The small winegrowers revolted against his strict policies on Shrove Tuesday, burning down the buildings of this firm. The revolt was called Revolta dos Borrachos (revolt of the drunks). Between 1732 and 1763, Italian architect Nicolau Nasoni designed a baroque church with a tower that became its architectural and visual icon: the Torre dos Clérigos (English: Clerics Tower). During the 18th and 19th centuries the city became an important industrial centre and saw its size and population increase. In 24 August 1820, a liberal revolution occurred, quickly spreading without resistance to the rest of the country. In 1822, a liberal constitution was accepted, partly through the efforts of the liberal assembly of Porto (Junta do Porto). When Miguel I of Portugal took the Portuguese throne in 1828, he rejected this constitution and reigned as an absolutist monarch. A Civil War was then fought from 1828 to 1834 between those supporting Constitutionalism, and those opposed to this change, keen on near-absolutism and led by D. Miguel. Porto rebelled again and had to undergo a siege of eighteen months between 1832 and 1833 by the absolutist army. Porto is also called "Cidade Invicta" (English: Unvanquished City) after successfully resisting the Miguelist siege. After the abdication of King Miguel, the liberal constitution was re-established. Porto features mainly a Mediterranean climate (Köppen climate classification Csb). As a result, its climate shares many characteristics with the coastal south: warm, dry summers and mild, rainy winters. Unlike the south, however, cool and rainy North Atlantic interludes interrupt the dry season and the season's average length is shorter, with three dry months. The annual precipitation is high and Porto is one of the wettest cities of Europe. However, long periods with mild temperatures and sunny days are frequent even during the rainiest months. Summers are typically sunny with average temperatures between 16 °C (61 °F) and 27 °C (81 °F) but can rise to as high as 38 °C (100 °F) during occasional heat waves. During such heat waves the humidity remains quite low but nearby forest fires can add haze and ash to the air making breathing somewhat uncomfortable, especially at night. Nearby beaches are often windy and usually cooler than the urban areas. In contrast, occasional summer rainy periods may last a few days and are characterised by showers and cool temperatures of around 20 °C (68 °F) in the afternoon. However, summer average temperatures are a few degrees cooler than those expected at more continentally Mediterranean influenced metropolises on the same parallels such as Barcelona and Rome. Porto never rivalled Lisbon in economic power, but as the most important city in the heavily industrialised northwest, many of the largest Portuguese corporations from diverse economic sectors, like Altri, Ambar, Amorim, Bial, Cerealis, BPI, CIN, EFACEC, Frulact, Lactogal, Millennium bcp, Porto Editora, Grupo RAR, Sonae, Sonae Indústria, and Unicer, are headquartered in the Greater Metropolitan Area of Porto, most notably, in the core municipalities of Maia, Matosinhos, Porto, and Vila Nova de Gaia. The road system capacity is augmented by the Via de Cintura Interna or A20, an internal highway connected to several motorways and city exits, complementing the Circunvalação 4-lane peripheric road, which borders the north of the city and connects the eastern side of the city to the Atlantic shore. The city is connected to Valença by highway A28, to Estarreja by the A29, to Lisbon by the A1, to Amarante by the A4 and to Braga by the A3. 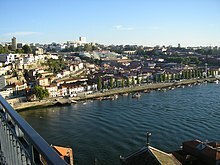 There is also an outer-ring road the A41 that connects all the main cities around Porto, linking the city to other major metropolitan highways such as the A7, A11, A42, A43 and A44. Since 2011, a new highway, the A32, connects the metropolitan area to São João da Madeira and Oliveira de Azeméis. Porto is served by Francisco de Sá Carneiro Airport which is located in Pedras Rubras, Moreira civil parish of the neighbouring Municipality of Maia, some 15 kilometres (9 miles) to the north-west of the city centre. The airport is a state-of-the-art facility, having undergone a massive programme of refurbishment due to the Euro 2004 football championships being partly hosted in the city. Porto's main railway station is situated in Campanhã, located in the eastern part of the city (connecting to the lines of Douro (Peso da Régua/Tua/Pocinho), Minho (Barcelos/Viana do Castelo/Valença) and Norte (on the main line to Aveiro, Coimbra and Lisbon). From here, both light rail and suburban rail services connect to the city centre. The main central station is São Bento Station, which is itself a notable landmark located in the heart of Porto. A tram network, of which only three lines remain one of them being a tourist line on the shores of the Douro, saw its construction begin in 12 September 1895, therefore being the first in the Iberian Peninsula. The lines in operation all use vintage tramcars, so the service has become a heritage tramway. STCP also operates these routes. The first line of the area's modern-tram, or light rail system, named Metro do Porto, opened for revenue service in January 2003 (after a brief period of free, introductory service in December 2002). Many renowned Portuguese music artists and cult bands such as GNR, Rui Veloso, Sérgio Godinho, Clã, Pluto and Ornatos Violeta are from the city or its metropolitan area. Porto has several museums, concert halls, theaters, cinemas, art galleries, libraries and book shops. The best-known museums of Porto are the National Museum Soares dos Reis (Museu Nacional de Soares dos Reis), which is dedicated especially to the Portuguese artistic movements from the 16th to the 20th century, and the Museum of Contemporary Art of the Serralves Foundation (Museu de Arte Contemporânea). The city has concert halls of a rare beauty and elegance such as the Coliseu do Porto by the Portuguese architect Cassiano Branco; an exquisite example of the Portuguese decorative arts. Other notable venues include the historical São João National Theatre, the Rivoli theatre, the Batalha cinema and Casa da Música, inaugurated in 2005. The city has the magnificent and beautiful "Lello Bookshop", that was featured in third place in The Guardian's list of world's top bookshops. From the three top bookshops, Lello was the only one that was originally built to be a bookshop, as the other ones were, respectively, a church and a theatre. Porto houses the largest synagogue in the Iberian Peninsula and one of the largest in Europe - Kadoorie Synagogue, inaugurated in 1938. The Francesinha - literally Frenchy, or more accurately little French (female) - is the most famous popular native snack food in Porto. It is a kind of sandwich with several meats covered with cheese and a special sauce made with beer and other ingredients. Over the last years, Porto has been experiencing an important touristic expansion, mainly caused by the Ryanair hub at Francisco de Sá Carneiro Airport. Porto won the European Best Destination 2012 and 2014 awards. The city has a large number of public and private elementary and secondary schools, as well as kindergartens and nurseries. Due to the depopulation of the city's interior, however, the number of students has dropped substantially in the last decade, forcing a closure of some institutions. The oldest and largest international school located in Porto is the Oporto British School, established in 1894. Porto district has the highest rate of tuberculosis positive cases in Portugal. Porto tuberculosis rates are at Third World proportions (comparatively, London faces a similar phenomenon). The incidence of positive cases was 23/100 000 nationwide in 1994, with a rate of 24/100 000 in Lisbon and 37/100 000 in Porto. Porto area represented the worst epidemiological situation in the country, with very high rates in some city boroughs and in some poor fishing and declining industrial communities. Epidemiological analysis indicated the existence of undisclosed sources of infection in these communities, responsible for continuing transmission despite a cure rate of 83% in the district. In 2002, the situation was not better with 34/100 000 nationwide and 64/100 000 in Porto district. In 2004 the situation improved to 53/100 000. As in most Portuguese cities, football is the most important sport. There are two main teams in Porto: FC Porto in the parish of Campanhã, in the eastern part of the city and Boavista in the area of Boavista in the parish of Ramalde, in the western part of the city, close to the city center. FC Porto is one of the Big Three, and the European champion in 1987 and 2004. 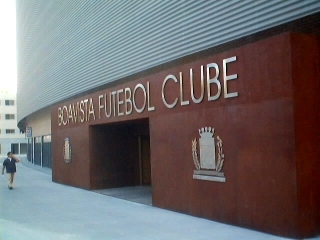 Boavista is considered the second club in the city, having won the championship once, in the 2000–01 season, but the club had financial and disciplinary problems and was demoted 2 tiers, returning to the first division in 2014. Formerly, Salgueiros from Paranhos was a regular first division club during the 1980s and 1990s but, due to financial indebtedness, the club folded in the 2000s. The club was refounded in 2008, and started to play at the regional level. They have since been promoted several times, and they now play at the 3rd level of Portugal's national football pyramid. The new Salgueiros club, however, plays outside the city in Pedrouços, Maia. ^ "Portugal International Dialing Code". http://portugal.embassyhomepage.com/portugal_international_dialling_code_portugal_cheap_international_calling_card_lisbon_telephone_area_codes_portugal_postal_codes.htm. Retrieved 12 September 2010. ^ ITDS, Rui Campos, Pedro Senos. "Statistics Portugal". Instituto Nacional de Estatística. http://www.ine.pt/xportal/xmain?xpid=INE&xpgid=ine_main. Retrieved 15 September 2011. ^ "The World According to GaWC 2010". http://www.lboro.ac.uk/gawc/gawcworlds.html. Globalization and World Cities Research Network. http://www.lboro.ac.uk/gawc/world2010t.html. Retrieved 23 November 2012. ^ "Online Etymology Dictionary". http://www.etymonline.com/index.php?term=portugal. Retrieved 18 December 2006. ^ "Port Wine". http://www.ivp.pt/pagina.asp?codPag=96&codSeccao=6&idioma=1. Retrieved 6 October 2006. ^ a b c "Historic Centre of Oporto". World Heritage List. UNESCO World Heritage Centre. http://whc.unesco.org/en/list/755. Retrieved 9 October 2014. ^ "Porto UNESCO Classification". http://english.cm-porto.pt/index.php?m=2&s=1. Retrieved 2 October 2008. ^ "Law nr. 11-A/2013, pages 552 99-100" (in Portuguese) (pdf). Diário da República. http://dre.pt/pdf1sdip/2013/01/01901/0000200147.pdf. Retrieved 29 July 2014. ^ "Normais Climatológicas - 1981-2010(provisórias) - Porto" (in Portuguese). Instituto de Meteorologia. http://www.ipma.pt/pt/oclima/normais.clima/1981-2010/014/. Retrieved 19 January 2013. ^ "Petrogal domina exportações". http://www.correiodamanha.pt/noticia.aspx?channelid=00000011-0000-0000-0000-000000000011&contentid=00213481-3333-3333-3333-000000213481. Retrieved 9 July 2008. ^ "Global Metro Monitor GDP 2014". Brookings Institution. http://www.brookings.edu/research/reports2/2015/01/22-global-metro-monitor. ^ "Porto Light Rail Project, Portugal". Railway Technology. http://www.railway-technology.com/projects/porto-light-rail/. Retrieved 6 May 2009. ^ AtlasWeb (2011). "Rotterdam and Porto: Cultural Capitals 2001: visitor research. - ATLAS Shop". atlas-webshop.org. http://www.atlas-webshop.org/epages/61492534.sf/en_GB/?ObjectPath=/Shops/61492534/Products/ATL_00023. Retrieved 5 July 2011. ^ "Top shelves". The Guardian. 11 January 2008. http://books.guardian.co.uk/shoptalk/story/0,,2239172,00.html. Retrieved 22 January 2008. ^ "São João Festival (St John Festival)". World Events Guide. Archived from the original on 17 September 2008. https://web.archive.org/web/20080917024856/http://www.worldeventsguide.com/event/4421/Porto-Portugal/S-o-Jo-o-Festival-St-John-Festival.html. Retrieved 6 May 2009. ^ "Federação Académica do Porto". Fap.pt. http://www.fap.pt/index.php?ch_site=queima. Retrieved 6 May 2009. ^ "London tuberculosis rates now at Third World proportions". PR Newswire. 6 December 2002. http://www.prnewswire.co.uk/news-releases/london-tuberculosis-rates-now-at-third-world-proportions-155822405.html. Retrieved 6 May 2009. ^ "View Article". Eurosurveillance. http://www.eurosurveillance.org/em/v01n03/0103-222.asp. Retrieved 6 May 2009. ^ "Geminações de Cidades e Vilas" (in Portuguese). Associação Nacional de Municípios Portugueses. http://www.anmp.pt/anmp/pro/mun1/gem101l0.php?cod_ent=M4000. Retrieved 2015-02-13. ^ "Bordeaux - Rayonnement européen et mondial" (in French). Mairie de Bordeaux. Archived from the original on 7 February 2013. http://web.archive.org/web/20130207154903/http://www.bordeaux.fr/p63778/europe%C2%A0et%C2%A0international. Retrieved 29 July 2013. ^ "Bordeaux-Atlas français de la coopération décentralisée et des autres actions extérieures" (in French). Délégation pour l’Action Extérieure des Collectivités Territoriales (Ministère des Affaires étrangères). Archived from the original on 7 February 2013. http://web.archive.org/web/20130207152951/http://www.cncd.fr/frontoffice/bdd-recherche-resultat.asp?searchField=bordeaux&x=36&y=14. Retrieved 29 July 2013. ^ "Bristol City – Town twinning". © 2009 Bristol City Council. http://www.bristol.gov.uk/ccm/navigation/leisure-and-culture/tourism-and-travel/town-twinning/. Retrieved 17 July 2009. ^ "Sister Cities of Nagasaki City". International Affairs Section, Nagasaki City Hall. Archived from the original on 29 July 2008. https://web.archive.org/web/20090729002642/http://www1.city.nagasaki.nagasaki.jp/kokusai/english/index-e.html. Retrieved 10 July 2009. This page uses content from the English language Wikipedia. The original content was at Porto. The list of authors can be seen in the page history. As with this Familypedia wiki, the content of Wikipedia is available under the Creative Commons License.